February is National Pet Dental Health Month, but your pet’s oral hygiene is something to think about year round! Whether you are brushing, using dental treats or rinses, or are thinking about beginning an oral care routine, we can help! 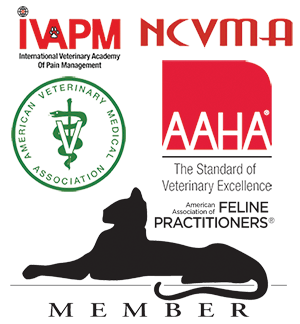 The American Veterinary Medical Association and American Animal Hospital Association have linked poor dental health to heart disease, liver disease and kidney disease in dogs and cats. Too often, we see animals come to us with serious health problems as a result of dental disease. What are the symptoms of dental disease? 1) Vetradent Dental Cleaning Wipe Sample. 3) CET Vanilla Mint Pet Toothpaste Sample. 5) CET Oral Health Chew. Make sure to tune into our Facebook and Instagram pages for dental product giveaways through the end of the month of February! If you’ve been waiting, now is the time to get your pet back on the path to excellent oral health! *Each pet will receive one entry per grade of tartar assigned during the pre-anesthetic exam. So if your pet receives a grade of tartar of 3, they would get three entries into the contest. The more your pet needs a cleaning, the better chance they have of winning the next one!